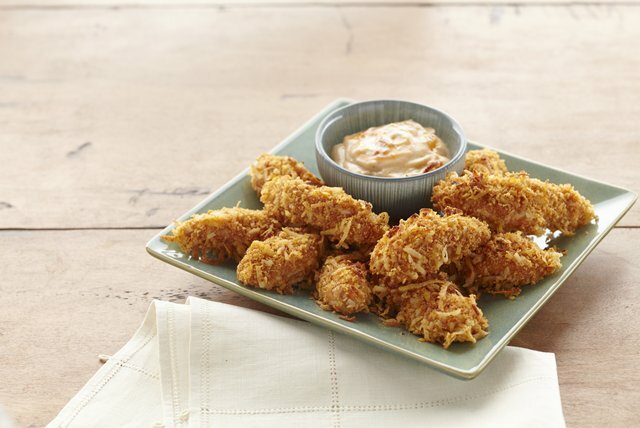 Homemade chicken fingers with a flavour twist and an extra crispy coating. Combine coating mix, coconut, curry powder and pepper in pie plate. Beat egg in second pie plate. Dip chicken in egg then in coating mixture, turning to evenly coat both sides of each strip. Place on rimmed baking sheet sprayed with cooking spray. Discard any remaining coating mixture. Bake 12 to 14 min. or until chicken is done. Meanwhile, mix Miracle Whip and chutney. Serve chicken as dippers with the sauce. Prepare as directed, doubling all ingredients. For best results, be sure to use a baking sheet large enough to arrange chicken strips in single layer on baking sheet.